As far as flooring goes, nothing is quite as durable or as reliable as porcelain tile. Due to the way it’s made, these tiles are fabulous at repelling water, which also means that they can avoid dirt, grime, and stains much better than most other options. However, that doesn’t mean that they are infallible, so you will still have to clean them on a regular basis. In fact, if you want to maintain the glistening and pristine shine that you had when you first installed them, then you will want to clean your floors about twice a week with a mop and water. While standard cleaning doesn’t get too involved, every month or so you should do a deeper cleaning that will remove any stuck on dirt or stains that are starting to set in. Although the tiles can repel that kind of stuff well, it can become a problem if you don’t do anything about it. So, for this guide, we are going to discuss the best way to get a deep clean for your porcelain tile floors so that they stay as shiny and brilliant as the day they were installed. We’ll also highlight the different techniques needed for the various types of tile you may have so that you can get the best results every time. Fortunately, cleaning your tiles is a relatively simple and straightforward process, so you shouldn’t need much in the way of equipment. The biggest challenge will be having the time to do the job right, so if you are an impatient person or you can’t keep the floor clear for at least an hour, then you should plan to wait until that becomes possible. If you want to make sure that your floor is as clean of dirt and debris as possible before you start mopping, then a vacuum will be a great way to go. However, if you do a thorough sweeping, you should be able to get everything off beforehand and still get amazing results. As we mentioned, there are different techniques depending on the type of porcelain tile you have. Typically speaking, you can have unpolished/unglazed, glazed, and textured. As such, we’ll highlight the steps needed for each floor type so that you can make sure that you’re doing the best thing for your tile. To ensure that you don’t get bits of debris embedded into your tile grouting it’s imperative that you sweep your floor as much as possible. As we discussed above, a vacuum can be an excellent way to ensure that you get everything, but if you don’t already have a hardwood vacuum then don’t worry about it. The way that you make the cleanser is to mix ¼ cup white vinegar to two gallons of water. You want to mop a generous layer onto the tile and let it sit for about five to ten minutes. If your tiles are glazed, then start with a layer of clean water, but don’t let it soak. Instead, mop the whole thing and soak up any puddles that may form. Then, after doing that, use the cleanser on stains or dirty areas that need extra attention. If you want to get the best results, you should sweep and mop in two directions. First, with the direction of the tile, and second, at a diagonal. This will ensure that you get everything in the textured parts that can be hard to clean thoroughly. You never want to use a hard bristle brush on the tile as it can leave scuff marks, especially if it is glazed. Thus, a gentle scrubbing motion with a soft bristle brush will remove dirt and grime easily. It’s best to do this as soon as the cleaner is on so that you can use the liquid to your advantage. It’s imperative that you don’t let the cleanser soak into the tile (except for textured surfaces) so make sure that you start rinsing before it dries. Use clean water and go over the whole floor liberally so that all of the cleaner is removed. With unglazed tile, it can be better to wipe the cleanser off with a towel first, but it’s not necessary. Once you’ve rinsed the whole thing, then you want to dry it off with a towel or a dry mop. Overall, you want to ensure that there is no liquid left on the tile whatsoever so that it won’t soak into your grouting and leave a potential stain later on. Once the floor is dry, you can buff it with a microfiber towel or cheesecloth to get that brilliant shine. For best results, try to keep the floor clear for at least half an hour before walking on it and resuming your daily routine. If that’s not possible, it’s okay, but it can ensure that the floor is 100% dry and won’t get gunk on it right away. And that’s it! Cleaning porcelain tile is relatively easy and simple to do, so you shouldn’t have any problems maintaining a smooth finish to your floors. If you do this once a month or so then the tiles should remain in prime condition for years to come. 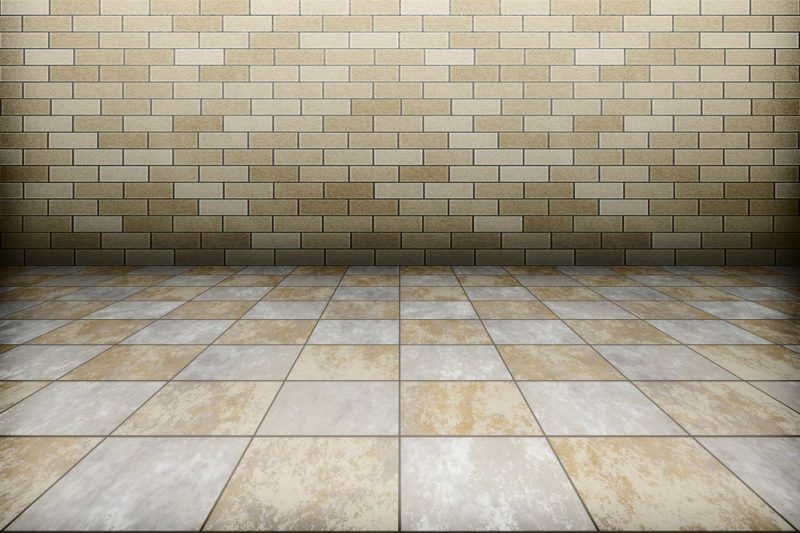 Thanks for checking out this tutorial, and we hope that your floors turn out beautifully.